Last week I was on vacation. I spent a great deal of time reading books, playing cards, visiting an aquarium, and watching The Office. It was a good trip. I thought I might have some deep reflections to share upon my return home: deep reflections about the importance of rest; deep reflections about taking time to enjoy the world around you; deep reflections about resisting the urge to let work and accomplishments define you. I have no deep reflections from the trip. But this morning--well let me tell you what happened this morning. I got to the the office like I do every Monday, and I started catching up on mail and messages from last week. Among other things, I looked at the attendance sheets people fill out in our Sunday services, and the visitor cards. And the Sunday I was out, we may have had the most visitors of all the weeks I've been serving here. Visitors, people I hadn't seen in a few weeks and missed, people who can only make it around occasionally, or who visit every now and then--and folks who may have just given the church its one chance... and I missed every single one of them. You've got to be kidding me. What the heck? ... Really. What the heck? I'm out one freaking week, and all of these people I would love to see and love to connect with are here. Way to not realize that May 12th (Mother's Day!) is the big visitor Sunday of the year. Apparently. Way to schedule your vacation like an idiot. I'm really glad all of these people were here that Sunday. I hope they experienced God's grace in worship. I'm glad there are dependable people I can ask to lead the service while I'm gone, and that those people were leading it that week. I'm glad the visitors were able to encounter this congregation and not just the guy who's assigned here for a few years and then leaves--oh, and apparently believes that his presence here on Sunday morning is super important. Because it is... and it isn't. I play a big role at Grace, a prominent role, and the Lord can use me in powerful ways. But it's the Lord doing that work, not me. In ministry, "neither the one who plants nor the one who waters is anything, but only God who gives the growth." (1 Cor 3:7) Different servants come--some of whom also have very prominent roles--and we all work towards the same goal, but our Lord accomplishes the work. And I don't think God was on vacation that week. Last Sunday, some of God's other servants had a chance to work in ways they might not get to every week. Yesterday, I was back: making announcements, leading prayers, preaching. Either way, both weeks, only God gives the growth. I'm thankful that the folks I missed weren't missed. It doesn't much matter that they couldn't hear a Nance Hixon sermon (some of my preaching, people probably would be better off without!) or shake Nance Hixon's hand on the way out of the church. The Holy Spirit, whom I pray works through my efforts, was present and at work through the efforts of others, and I've got to learn to trust that. 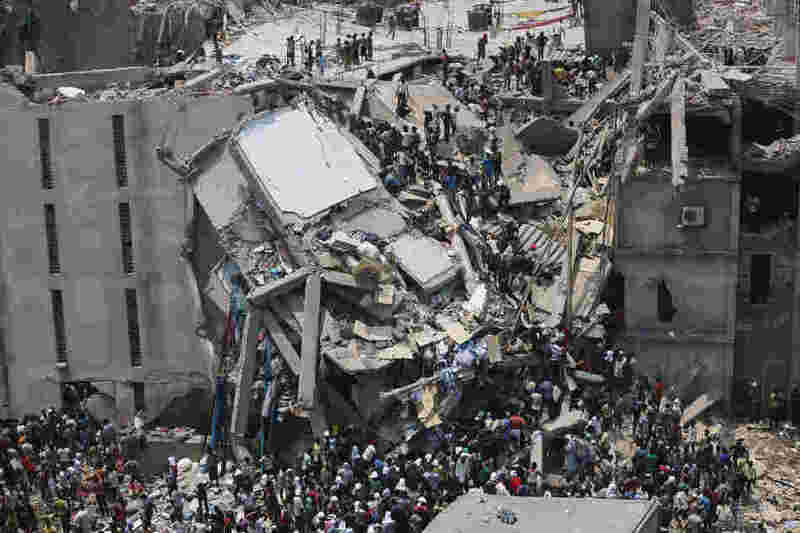 Somehow - God's grace - with everything else happening in the world, news concerning the grisly garment factory collapse in Bangladesh on April 24th is still making headlines. Yesterday, Time released a photograph from the scene of the collapse, where two workers died embracing each other as the building came down around them (you can see the image by following the link; given the content, I decided not to post it here). The photographer, who was present all day following the catastrophe, writes: "Every time I look back to this photo, I feel uncomfortable - it haunts me. It's as if they are saying to me, we are not a number - not only cheap labor and cheap lives. We are human beings like you. Our life is precious like yours, and our dreams are precious too." According to the last report I saw, 794 men and women are believed to have died in the collapse--and I expect that total will continue to rise. And the merchants of the earth weep and mourn for her, since no one buys their cargo anymore, cargo of gold, silver, jewels and pearls, fine linen, purple, silk and scarlet, all kinds of scented wood, all articles of ivory, all articles of costly wood, bronze, iron, and marble, cinnamon, spice, incense, myrrh, frankincense, wine, olive oil, choice flour and wheat, cattle and sheep, horses and chariots, slaves--and human lives. "The fruit for which your soul longed has gone from you, and all your dainties and your splendor are lost to you, never to be found again!" The longer John's catalog of cargo goes on, the clearer it is that John's not impressed by these 'goods'. Luxury turns into monotony. These are but "dainties and splendor," which God's judgment has wiped away. But not only is this evidence that Babylon has "glorified herself and lived luxuriously" (18:7), this is also evidence of Babylon's "exploitation of the wealth of her empire at her subjects' expense. "* The problem is not just the luxurious living, but also the oppressive economics that supported Rome's comfort. That's most obvious with the references to "slaves--and human lives," but people living in the Roman Empire in the 1st century, the people John was writing Revelation for, would know, often firsthand, about the extent of Rome's exploitation of the lands she conquered. This went beyond slavery. In a famous speech before battle with Roman forces, a Celtic chieftain from this time, named Calgacus, denounced the Romans as the "robbers of the world." They plunder, butcher, and steal, he said, and they misname all of this "empire." This was the source of her luxury: the oppression and plundering of the lands and peoples under her influence. And the first readers of Revelation, those living in the Roman empire, to whom John was writing, would have known this as they read through the catalogs of stolen goods. Last week, in response to the factory collapse in Bangladesh, a piece by Wendy McMahan appeared on Christianity Today asking the Church to face the hard truths of how the cheap goods we enjoy in the US today often come at a frightening price to the workers producing them. "We need to stop and consider," she writes, "how most of us have supported an industry that lets people work in these dangerous conditions." Read it here: Ignoring Worker Injustice Won't Make It Go Away. Our spending, she suggests, ultimately shows that "we tend to care more about the price of our clothing than the conditions under which they are made." This is partly because we are so far removed from these people: "I will never meet my seamstress." Yet, she insists, there's another factor we cannot ignore: that we have failed to love. "My sin against her is that I have loved myself too much, and her too little." Our failure to love these neighbors, I believe, makes us no different than Babylon, exploiting the nations of the world so we can revel in our luxury and splendor. We have supported an economic system that routinely sends people into unsafe conditions to work long hours for stunningly low wages. Our demands for cheap products leave countless, faceless workers in a vicious cycle of low wages, non-existent benefits, and even, occasionally, factory fires or building collapses. (I've written about some of these issues before, focusing on Chinese manufacturing: the China price and me.) And if we can ignore these occasional news stories long enough, they'll go away, and we can move on. Well, Revelation calls believers to stop ignoring it, to come out of Babylon and take no part in her sins (18:4). Christians cannot remain comfortable consumers in a system that abuses our neighbors across the globe, just so long as we can get our goods. That's Babylon's way; that's not the way of the Lamb, Jesus Christ. And we're called to follow the Lamb, to love our neighbors, to look out for their needs and their good. So we have to find an alternative. 1) "Support clothing companies that treat their workers well." One resource she recommends is The Better World Shopper. This organization offers information to guide your purchases on their website, with a smart phone app, and through a book. Another resource on fair trade is Trade as One, a Christian organization that "has been advocating consumer justice for years." 2) "Buy less new clothing." The overstuffed drawers and closets in my house just might be a sign that my family doesn't need every piece of clothing that we own. We certainly don't need more. Buying less also allows us to invest more on fewer items produced under just and ethical conditions, rather than paying for piece after piece of cheap clothing. Plus, there are always thrift shops. Buying secondhand is resourceful and doesn't demand new supplies or labor be used for our clothing. 3) "Give to programs that offer workers another option." She leaves it to us to find out the best resources here, but the fact is, in Bangladesh and in other countries across the world there are organizations working to provide better opportunities for those otherwise consigned to a life of factory work--and we can help support their efforts. If we took these suggestions seriously, they would make a strong start to a new way of life as consumers--and Christians who are entwined in economics that abuse our neighbors, "Babylonian" economics, we have to find a new way. We have to try and love our distant, nameless neighbors, even though it takes more effort, costs more money. That's just what it involves, following the Lamb out of Babylon. * This description comes from the New Testament scholar Richard Bauckham, in The Theology of the Book of Revelation, p. 135. 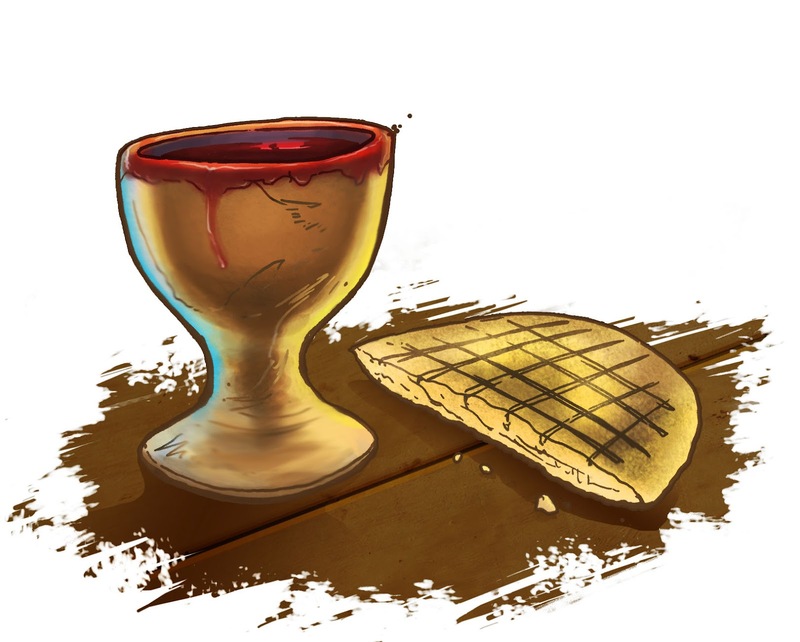 At Grace UMC we receive communion once a month, on the first Sunday of each month (plus the occasional special service, like Holy Thursday). Compared to some churches, this is pretty infrequent, but compared to my experience growing up, where we might celebrate the Lord's Supper three or four times a year, once a month is treasure for which I'm so thankful. I'm thankful because I find communion to be a powerful, life-giving experience. I'm thankful because I believe something truly miraculous happens at the Lord's table: we encounter Jesus Christ--"this is my body" means that is his body, and "this is my blood" means that is his blood. There's nothing magic about the service or the words I say there, but when I pray for the Holy Spirit to touch the bread and the cup to "make them be for us the body and blood of Christ," the Spirit uses that time and those elements to connect us to Jesus. I could spill a lot of digital ink here over why I believe these things and what exactly they mean, but that's not my aim right now. Instead, I have a question for those of us who will be kneeling this Sunday morning with our hands out to receive a piece of bread. If this moment and this sacrament uniquely and powerfully connect us to Jesus through the Holy Spirit, how are we going to prepare for this? Thomas a' Kempis, in his classic devotional book, The Imitation of Christ, forces his readers to face this question. Jesus invites us, sinners, weary and burdened, to come to him (Matt 11:28). Jesus instituted the practice of communion at the Last Supper so that we could have an established means of drawing near to him and encountering him--he didn't leave us without a way to find him. At this table, we find grace, our souls are restored, and "the beauty destroyed by sin returns again"! And yet, how do we prepare ourselves to receive this gift? Moses, he points out, made the Ark of the Covenant "out of imperishable wood, overlaying it with the purest gold," to place the two tablets of the Law, the Ten Commandments, inside. "Then how shall I, a corrupt and perishable creature, dare so lightly to receive the Maker of the Law and the Giver of life" at communion? King Solomon spent seven years building "a resplendent temple, for the worship of Your Name, the dedication of which was celebrated for eight days; a thousand peace offerings were sacrificed - and with great solemnity and rejoicing - and accompanied by the sound of trumpets." And yet I, he goes on, who can barely devote myself to you for half an hour, shall I invite your very presence at the altar? "O my God, how much did those great persons of the Old Testament do to please You! How little I do and how short is the time I give to prepare myself for the reception of Holy Communion!" How are you going to prepare yourself for Holy Communion this Sunday? Maybe you should take some time to pray that God would "cleanse the thoughts of our hearts" for an encounter with Jesus. Maybe you could read over the story of Christ's execution in one of the gospels, to remember the cost he paid with his body and blood so that we could be saved. Or maybe you could just use some time of quiet, to let the voices in your mind fall silent and let the distractions fade away, so that you can focus and appreciate what's happening at that table and that kneeling rail. Whatever you need to do, just do it. This week, let's try to honor God with some fore-thought and some preparation. You just might find that all of your hurried experiences of grace at communion were only the tip of the iceberg. As important as preparation is, and as seriously as we ought to take it, we can't forget that the Lord's table is first and foremost place of grace--and that means you don't have to earn a spot at it. a' Kempis makes the point powerfully in an imaginative dialogue between Jesus and a follower of Christ. "You must realize," Jesus says, "that you cannot make adequate preparation for Me through your own merits, even if you prepared yourself for an entire year with your mind on nothing else. It is through My generosity and grace that you are allowed to approach my table." Because we only come to the table by Christ's generosity and grace, he can say: "Do the best you can and as well as you can... I am He Who has invited you, and I have commanded this Sacrament to be; therefore, I will make up for whatever is lacking in you. Come, then, and receive Me." Prepare yourself to come to the table. But remember, we approach by grace, so however unprepared or unworthy you feel, Jesus welcomes you still. He'll make up for whatever we lack. So let's come, then, and receive him.